Since 1891 The Sailor’s Home and Missions to Seamen has operated a launch for the use of visiting ships and their crews visiting the anchorages of Hong Kong. The name of the Mission’s first ever launch in Hong Kong was Dayspring, a name taken directly from St. Luke’s Gospel Chapter 1 verse 78: “through the tender mercy of our God, the Dayspring will dawn upon us from on high, to give light to those who sit in darkness and in the shadow of death, to guide our feet into the way of peace”. The sentiment of the Dayspring dawning upon us is as real to seafarers today as it was all those years ago when the first Mission launch rode the waves of Hong Kong harbor and so we would like to honour our history and traditions in reinstating that name for our new launch. The new launch has been designed to bring Chaplains and other ship visitors safely to the ships visiting the Hong Kong anchorages today. She will bring hope to those who feel lonely and sad at being far away from family and friends and will display the love and care of God to all seafarers by bringing news from home and the latest telecommunication/data aids available. And for those fortunate crews to be allowed shore leave she will operate as a taxi service to and from shore. Today it is just as important as it ever was to bring hope and light to those who feel forgotten or marginalized and nevermore has this been the case than for today’s seafarers. With manning levels cut to the minimum on many vessels and turn around times kept short there is very little opportunity for shore leave. The generosity of our many donors has made it possible to bring our new Dayspring into service and for that the Mission and, we are sure, the many thousands of seafarers who will benefit from her service, are most grateful. 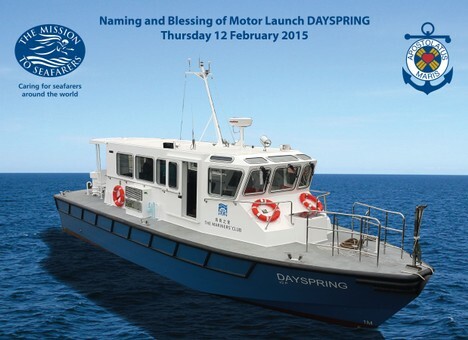 We name this Motor Launch DAYSPRING, may God bless her and all who sail in her……. Archbishop: We have come together this day to thank Almighty God, and to ask his blessing on the labours of all those who have built this ship which now awaits her launch upon the waters. I call upon you to pray for God’s blessing on this ship, for those who built her, and those who will serve upon her. Bishop: Great God of earth and heaven and sea, we praise your Holy Name for the vision and imagination of those who initiated the building of this ship. We thank you for those who designed and planned her, and all, who by their skill of hand and of eye, have been responsible for her construction. Bishop: O Lord God Almighty, let your blessing be upon this ship, and upon all those who will serve and sail in her. May good success and your protection and the guardianship of the holy angels always be with them. In the name of the Father, and of the Son and of the Holy Spirit. Amen. Bishop: O Lord, when thou givest to your servants to endeavour in any great matter, grant us also to know that it is not the beginning but the continuing of the same until it be thoroughly finished that yieldeth the true glory; through him who for the finishing of thy work laid down his life, Jesus Christ our Lord. Amen. Archbishop: Go forth into the world in peace: be of good courage; hold fast that which is good; render to no one evil for evil; strengthen the fainthearted; support the weak; help the afflicted; honour all people; love and serve the Lord, rejoicing in the power of the Holy Spirit. And the blessing of God Almighty, the Father, the Son and the Holy Spirit, be upon you and remain with you always. Amen. We proceed on board where JOHN AND AKINA WILSON AND THEIR DAUGHTER ELLIE will cut the cake and unveil the plaques to commemorate the naming and commissioning of MOTOR LAUNCH DAYSPRING.